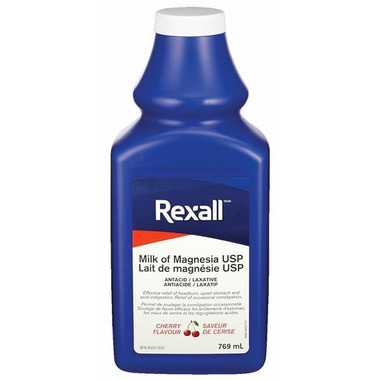 The Rexall Milk Of Magnesia is an antacid and laxative. It provides the effective relief of heartburn, upset stomach and indigestion, and occasional constipation. Recommended Usage: Antacid: for the relief of stomach upset. Adults: take 1 to 3 tablespoons 1 to 4 times a day. Laxative: Relief of occasional constipation. Adults: Take 2 to 4 tablespoons followed by a full glass of water 1 time a day.